Asafi Imambara also known as Bara Imambara or Bada Imambara is the largest and grandest historical monument in Lucknow city. Imambara means Shia Muslims' Shrine. 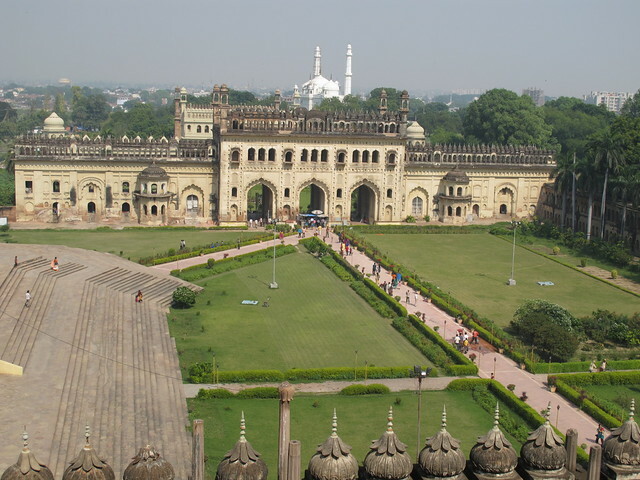 In 17th century, Asaf-ud-Daula, the Nawab of Lucknow built the Bada Imambara. 'Bara' implies 'big' and 'imambara' implies 'sacred hall where Muslims perform their rituals around the time of Muharram, the major festival of mourning for the death of Hussein in the battle of Karbala. The Imambara Complex also includes the Asfi Mosque, BhulBhulaiya - a Labyrinth and Step well which has running water. As per historical facts, the Nawab built this Imambara in order to provide work to ordinary people who suffered in great famine in 17th century. It took approximately 6 years (1785-91) to complete the construction. In those days itself, it cost over 10 million Rupees to construct this grand structure. The building includes the mosque, the labyrinth (Bhul Bhulaiya) and a stepping well with running water (bowli). There are two gateways that lead to the main hall. It is said that there are 1024 ways to reach the terrace but only one way to come back. The ravishing architecture of the complex reflects the grandeur of the ornamental Mughal design. The main feature of this building is that iron and European architecture has not been used anywhere. The interior of the building is also picturesque that it will leave you amazed. Like Badshahi Mosque in Lahore, no European materials or iron was used for its constructions. The main Imambara which has the tomb of Asaf-Ud-Daula stands elegantly without any support beams. The height of the ceiling of central hall is 15 meters. The amazing hollow walls of the central hall help in keeping it cool during summer and also lighten the load of the structure. Eight chambers which surround the main Imambara are interlinked by a wide labyrinth - known as Bhool-Bhulaiyan consisting entanglement of 486 zig-zag ways. Bhool-Bhulaiyan is the most interesting and fascinating structure of Bara Imambara. The Rumi Darwaza which is situated just outside the main Imambara is of 18 m tall. In that period of time the architect from Delhi won the contract of construction over tough competitive procedure. You can see the architect’s tomb by the side of tomb of Nawab inside main chamber. As per legends the secret passages which link the Imambara with other places like Gomti River, Delhi, Faizabad and Allahabad have been closed permanently. For better understanding of the architecture and history, take services of the guide. It will also be more fun in Bhool Bhulaiyaa (maze) as well. On entering the Imambara you will find Asafi Masjid on your right. It is another great peace of architecture with sculptured domes and minarets. During summers, its better to visit the place in evening to escape the heat. You can buy a discounted COMBINED Ticket for visiting Bara Imambara, Bhool Bhlaia, Shahi Hamam, Bouli, Picture Gallery, Chhota Imambara.